My Very First Blog: Happy Merdeka To All Malaysians! 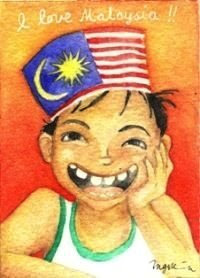 Malaysia is celebrating its 51st Independence (Merdeka) Day on 31st August. Despite some things that you may not like about Malaysia, you have to admit that when you list out all the good things about this country, the good simply outnumber the bad by a wide margin! So let us count our blessings and be thankful that Malaysia is our country. Monica tagged me with this Merdeka meme and in return I would like to tag the following people. By the way, five of you are lucky as you are on list no.31 which is the day of Merdeka. Have fun and have a wonderful Merdeka Day! 1. Add your site(s) to the list if you're a proud Malaysian Blogger! 2. Pass this tag to as many Malaysian Blogger as you know, or if you're interested but nobody tags you, just include yourself voluntarily. Show some patriotism! 3. Once you've done posting this tag, leave a comment HERE! and you will be visited by a Malaysian local fruit, Mangosteen by the name of Mango! and added to the Master List. 4. Update list regularly to ensure every Malaysian Blogger gets equal link benefit. 1. mangosteenskin - Saya anak Malaysia! 2. Life is too short to be ordinary - Malaysia Tanahair Ku! 3. Sha's Love & Passion - Aku Anak Merdeka 4. A room of crazy scrapper - Merdeka!Merdeka! Merdeka? 5. Fliffy - Aku Patriotik, Sayang Malaysia ! 6. Rizal 7. haniz - Merdeka Forever! 8. Prozak Nation 9. CarolPinky - Proud Malaysian! 10. Mariuca - I heart Malaysia! 11. Emila’s Illustrated Blog - Saya Anak Malaysia juga 12. Simple Life - Sam - Saya Anak Malaysia 13. Shemah's My Sweet Escape - Live, Enjoy and Love.. MALAYSIA! 14. Mariuca's Perfume Gallery - Made in Malaysia! 15. Yani-Tennitodoku-Proud to be a Malaysian-MERDEKA! 16.Bluecrystaldude from My Little Black Pot - Saya Harap Malaysia Terus Maju! 17. Apples of the eyes 18. Snapshotcap - Freedom of choice is made for you my friend :) 19. Anaheus 20.Confessions Of A Breathing Tote Bag 21. A Great Pleasure - Malaysia is a food paradise ~ simply yummy~licious! 22. Mummy HnH - Harith and Hannah - MERDEKA 51st Celebration!!! 23. Shafie - I'm Here For U Malaysia 24. Nessa - Happy 51st Merdeka, Malaysia! 25. marvic 26. Deasya 27. Asian Mutt International 28. Point Blank - Sokonglah Pelancongan Domestik, Malaysia Cantik Indah Nian! 29. Turn-u-Off 30. My Very First Blog - Be Thankful You're Malaysian! 31. You're next! Selamat menyambut hari kemerdekaan! Happy Merdeka Day Malaysians! Merdeka! Merdeka! Merdeka! I would love to visit Malaysia! It looks beautiful and exotic. Nowhere is perfect. Happy Merdeka Day to you! Foong, thanks so much for the thought but I guess you are not aware that I don't do tags? Simply not good at them. Thanks again.